This is an adventure novel set in the mountains near Squamish BC. Tabitha, her widowed Aunt Tess and two cousins, Cedar and Ashley, set out on a Thanksgiving weekend hike to spread Uncle Bruce’s ashes overlooking a bluff. It is Tabitha’s first hiking experience and she doesn’t want to be there. It seems like her cousins don’t want her to be there with them either. I liked the tension that arouse from the environmental conditions. You can’t spend time in the wilderness around here without having a healthy respect for bears. When Tabitha has a run in with a bear I was right there with her. You can’t spend much time in the Pacific Northwest without having a healthy respect for the rain. The parts of the novel when the group are in danger or trapped because of the weather and ensuing high waters in lakes and rivers are frightening realistic. These aspects of the novel kept me reading til the end. I didn’t like the tension between the two girl cousins. It didn’t feel authentic to me. I don’t much like those girls bullying girl books. Unfortunately this book often felt too much like one of them. 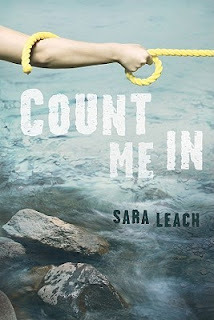 I am sure that Leach wanted this to be about a girl who learns what she is capable of, and learns to stand up for herself. For me however it was too much about a girl being a victim. I would have liked this book much more had Leach made this more of an adventure novel with more realistic relationships between the characters. That said, I am sure that there are many readers who will find this an engaging and satisfying read.